For now I thought it would be fun to show a little behind the scenes, since I was involved in the setup. 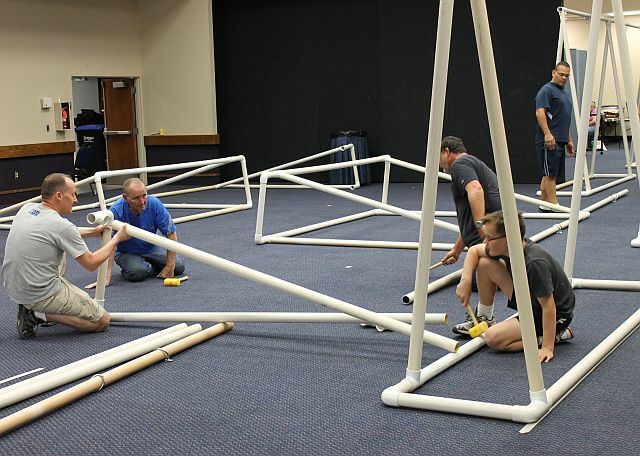 It’s a lot of work to put on a show! 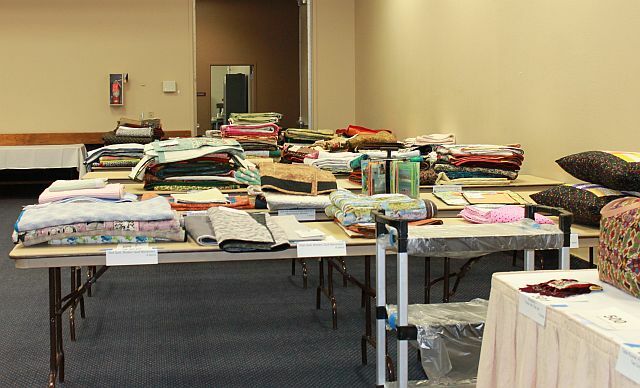 Monday was check in day for the 200+ quilts, wallhangings, wearables, dolls and more that will be seen this weekend. 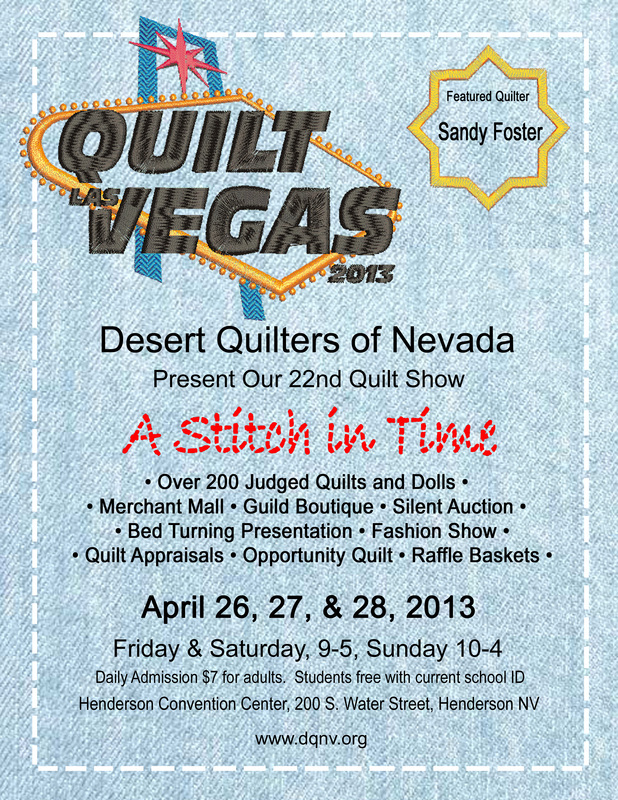 Our guild is an “educational organization” which promotes the art of quilting and therefore run by all volunteers. These ladies work tirelessly to put on a good event! 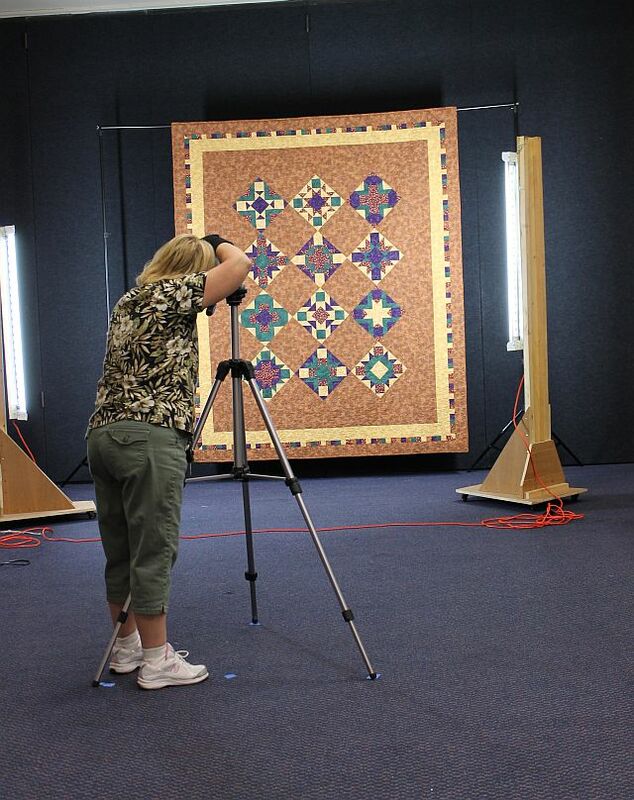 Tuesday was photography and most of the quilt judging. 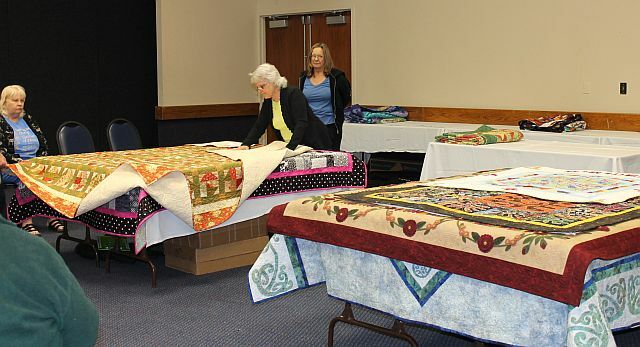 Each quilt was loaded onto a quilt rack or pinned to the wall before being judged. 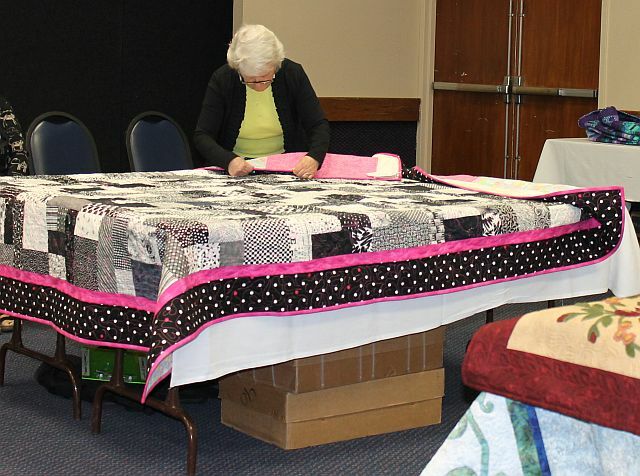 An NQA certified judge, Edie Richmond Dyke, carefully evaluated each and every quilt. The volunteer quilt handlers would take a stack of quits per category, lay them out onto a table so the judge could go over them in detail. Those of us in the room were not to breathe a word or let her know in anyway if she happened to be looking at our quilts, or those of anyone we knew. It was such a wonderful experience to listen to her thoughtful comments on how to improve and even more exciting when she liked one of my quilts! Volunteer scribes would right down her comments on an evaluation form for the owner to read later. Wednesday and Thursday were set up and quilt hanging. 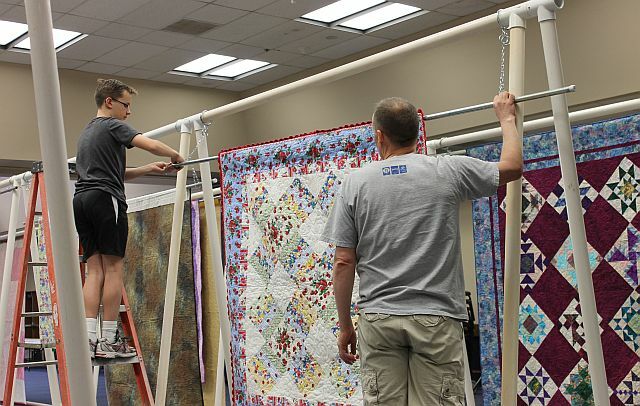 Most of the large quilts were hung on pvc pipe frames that were assembled mostly by volunteer husbands and sons. My son Ryan was earning some community service ours for a scouting merit badge so they were happy to have some extra help! Probably the thing I liked best about helping out was being able to see many of the quilts up close and personal. This weekend I will take my time, look at all of the quilts in detail, read the artists’ statements and bask in the fun of it all! Very interesting insight into the running of a quilt show! It was a great show…sorry I missed you! I volunteered as a scribe for our guild show last fall. Aside from the writer’s cramp, it was a great learning experience. 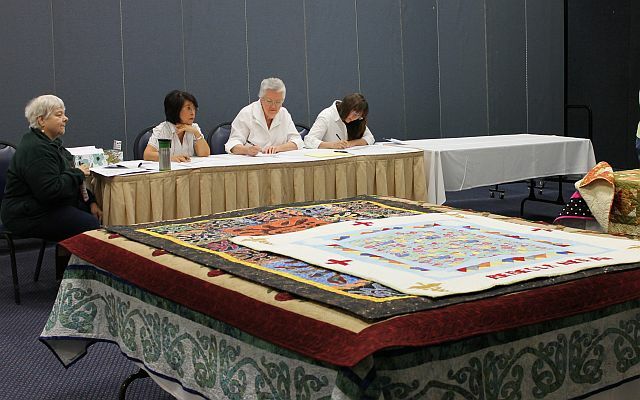 We’ve invited the judge to be a speaker at the guild this summer to coach on finishing quilts as the bulk of the criticism was related to finishing. I hope you have a fun weekend. Thanks so much for a sneak look at the set up…and congrats to you…will come back to see more pictures!